Version 2.2.0 of the Jopr management platform has been released today. It is a powerful system that allows you to manage a complex, distributed environment of deployed hardware and software. Jopr has a plugin architecture allowing different plugins to provide management for specific products or systems. Jopr provides strong management support for environments running JBoss Application Servers but out of the box provides a large set of plugins for managing an entire system. For example, platform plugins (Linux, Windows), database plugins (Oracle, Postgres), Hibernate, Apache web server, and many, many more. A major addition in Jopr 2.2 is the Tomcat plugin, introducing powerful management for standalone Tomcat environments via Jopr. Jopr already provided support for Tomcat embedded in JBoss Application Server and the new Tomcat plugin completes the picture. The beauty of Tomcat management with Jopr is that Tomcat is often only one piece of your infrastructure. With Jopr you get seamless, holistic management of your whole, distributed, environment, from hardware, to middleware, to applications. And, Jopr is completely extensible, allowing easy custom plugin writing and deployment. 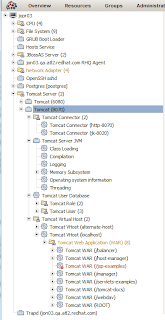 OK, let's take a look at what the new Tomcat plugin provides. Manual discovery of Tomcat Servers. As Jopr utilizes the Tomcat JMX Beans your Tomcat server does need to be enabled for remote JMX access. Secure, authenticated JMX is supported. Any Jopr Operation can be executed immediately or flexibly scheduled for future or repeated executions. Operations can also be executed in response to the firing of a triggered alert. Web applications offer a full slate of management and monitoring options. Configuration changes to the Tomcat Server are applied immediately and persisted, surviving Tomcat restarts. Supports management of multiple hosts and configuration of deploy options for the hosts. 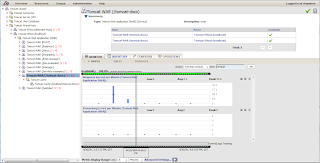 For environments using Tomcat's default Realm and supplied User Database, manage your users with immediate and persisted updates. Group together resources of the same type, like your Tomcat Servers, and immediately see a cluster view of your resources, easily pointing out similarities and differences. Perform configuration update or operations across the cluster. See your data graphically, with personal views and overlayed metric charts. Granular metric collection scheduling and access to plenty of historical data. Plus, aggregate views for manually created or autogroups. Define simple or complex alerts with various notification options. Schedule immediate or scheduled operations. A Quick summary of important activity for any Tomcat resource. Plus, a timeline view for correlating availability, operations, alerts and other activity for your resource. Complete role-based and permission based security for Jopr users limits access to and authorization of inventoried resources. If you've used Jopr for your management needs in the past then this adds one more tool for you to use. If you haven't I hope you found this brief introduction useful. Download Jopr 2.2.0 and let us know what you like and what you'd still like to see for Tomcat management in Jopr. Going to try it now. I like the sounds of this. Can it be used to automate the deployment of WAR files? As for automating WAR deployment, I'm not sure exactly if we support what you are looking for in Jopr 2.2. Perhaps we do, again, check out the link above. I can say this, we are working actively in trunk to support a remote api that will allow you to deploy content via your own remote app/script. Hi, I installed Jopr 2.2 last week and it discovery without problems the Jboss and Tomcat (standalone) in my laptop. But I think I did something went wrong cause the Tomcat doesn't send any information. Is there any kind of installation requirements or step-by-step manual to correctly "plug" the Tomcat to JOPR ? You'll need to restart after adding this. The above is not authenticated, if you want to have authenticated JMX access then ollow the steps for secure access as described here: http://java.sun.com/j2se/1.5.0/docs/guide/management/agent.html. If you use authenticated access then you'll need to set the username/passowrd in the Tomcat Server Connection properties after the server is discovered by Jopr. I followed all the instructions, can use JConsole to connect to Tomcat's JMX server, but the plugin still thinks that there's no measurement data. Am I missing something? Any ideas why it might (mis)behave like that? I'm not sure. Take a look at  and ensure everything looks correct. There was an issue with symlinks that has been corrected in trunk. If you continue to have issues please post in the Jopr forum  or possibly jump on IRC at #jopr. The JBoss Embedded Tomcat management is actually performed by the JBoss AS plugin as opposed to the Standalone Tomcat plugin. There are various reasons why you may be having issues. If your server resource is unavailable it's often due to not supplying login credentials in the connection properties. If it's available but you're getting no metrics it may be that you've not enabled the server for remote JMX access. See here for more on that issue . banlin, See http://www.jboss.org/rhq for the latest version and news. I want to use the Content Patching facility in JON for Tomcatv5 and Tomcatv6. The plug-in for Tomcat doesn't seem to support Content Patching. Is there a new version of the plug-in for Tomcat that supports Content patching in JON? If you are asking whether the Tomcat plugin supports patching the Tomcat installation itself, I think the answer is no. I believe the Tomcat plugin supports only WAR file deployment and update as content-related services. If you are are a JON subscriber you could open a support case and perhaps make an official feature request for any desired functionality. Thanks! Also, feel free to ask questions on IRC, #rhq on freenode, or use the RHQ forums.